Buried ARNHEM OOSTERBEEK WAR CEMETERY, Netherlands. 27. C. 8. Aged 22. Son of Frederick Alfred and Susan Churchyard, of Brandon, Suffolk. 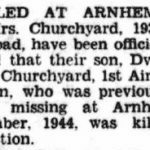 Driver Sydney L Churchyard was a member of 253 R.A.S.C. Light Composite Company, serving with 610 Squadron, flying Short Stirling Bombers. He was an ‘air despatcher’ from 49th Air Despatch Group but serving under 1st Airborne Division. His task would have involved him dropping panniers of supplies on parachutes from the aircraft in flight to the troops on the ground. On 21st September 1944, during Operation Market Garden, the assault on Arnhem, his aircraft took off from R.A.F. Fairford. It is very likely he flew the previous days missions and knew exactly how perilous it was. His aircraft was involved in re-supplying the troops on the ground and the enemy would most certainly have been waiting, so any subsequent airdrops would be fraught with danger. On the doomed mission they were carrying much needed ammunition for anti-tank guns. At about 15.30, during that afternoon, while over the Oosterbeek perimeter, his aircraft was hit by flak and shot down, crashing in flames between the towns of Heelsum and Wolfheze. Some of the crew baled out, two were taken prisoner while three managed to evade capture. One crew member, Flight Officer Thomas, died when he fell from his badly damaged gun turret and it is believed the two air despatchers, including Sydney Churchyard, suffered a similar fate. It was reported that Sydney’s body was found on the edge of a wood at Heelsum, a short distance away. Although he was given a burial, his body was exhumed and re-buried on 8th January 1946.